Where Do My Animation Resources Dues Go? This is a Drobo 5n network attached server. This holds five 10TB hard drives. With a usable disk space of 30TB. It spreads the data across all five drives, so if one hard drive fails, or even two hard drives crash at the same time, all we have to do is pop a new drive in, and the data is recreated from the redundant data on the remaining drives. Our volunteers have invested tens of thousands of hours into digitizing animated films and artwork for our archive database. A solid backup plan and equipment like this is vital to protecting that investment. When we began accepting memberships four years ago, all we had was one copy of each digital file in our collection on hard drives that dated back as far as six years. Since then, we have been using the money from the membership dues to purchase new, more rugged drives and disk arrays like this Drobo. At this point between our master servers and all of our backups, we have nearly 200 TB of data. All of our data is fully protected now, so now we are ready to take the next step. 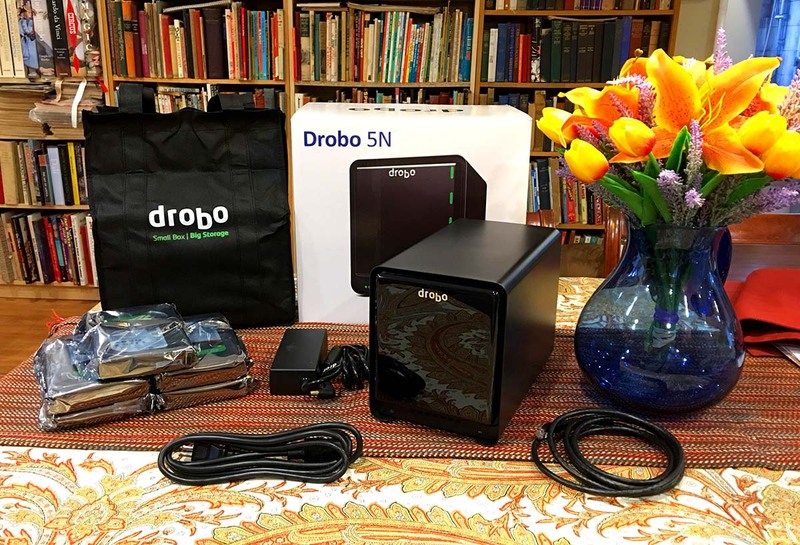 This Drobo 5n has the potential to allow us to connect our database to the internet, so volunteers who don’t happen to live in the Los Angeles area can log in remotely to help us catalog and cross link our collection. In the past year or two, we have purchased five of these Drobo disk arrays, which are capable of hosting all of our current work files. This will allow us to catalog our material much faster than we have been ever been able to in the past. Currently, our two main computers are 6 years old and our 12 years old backup computers died recently. We make do with what we have, but in order to run the database properly, we need speed. If you are upgrading your Mac, consider donating your old one to Animation Resources. We are a 501(c)(3) non-profit, so your donation may be tax deductible. Our short term goal is to get a Mac Pro with solid state drives that will be able to run our whole database at usable speeds. But we can’t afford that with the number of members we now have. Eventually, we would like to start migrating our database to a cloud server, accessible through the Members Only Page. We would also like to be able to make our collection available to universities and libraries via the internet, so the archive’s reach can be worldwide. That’s still a few years in the future, but every step we take gets us closer and closer to our goal. The speed that we progress is directly related to the amount of financial support our members contribute to the project. If you are a creative artist, you should be a member of Animation Resources so you can be a part of everything we do… The best part is that your dues rate is grandfathered in for as long as you maintain your membership with us. When we do put our database online, dues will be significantly higher to support the required bandwidth. But the members who helped us get to that point will share in our achievements with a low dues rate forever. It’s our way of thanking the people who help us grow. Animation Resources depends on your contributions to support its projects. Even if you can’t afford to join our group right now, please click the button below to donate whatever you can afford using PayPal. Posted in fundraising, membership | Comments Off on Where Do My Animation Resources Dues Go? Visit The Animation Resources Download Store! The Animation Resources Download Store is back up and updated. If you missed out on some of the e-books and videos in our previous Reference Packs, you will find lots of wonderful things there to buy! Currently there are 10 e-books and 16 videos to choose from. All of the proceeds go to fund the projects of Animation Resources. Thank you for your support! Posted in fundraising, store | Comments Off on Visit The Animation Resources Download Store!